The following history of the Fraternity presents only the main facts of its inception and development. A more detailed consideration may be had from other sources. It is the purpose, at this time, simply to give the reader a framework of facts for introducing Delta Phi Epsilon and, later, by other means to facilitate a better acquaintance with more intimate matters. Three students enrolled in the School in the fall of 1919: Alfred O. Arseneau, Wesley O. Ash and Samuel C. Bartlett. All three were lately returned from overseas military service and living together in Washington, D.C. in a rooming house at 10th and I Streets, NW. At first, the three had little in common besides the bond of overseas experience; but gradually their interest in foreign service as a career drew them closer together. These three men had, first of all, a community idea. They believed that, if foreign trade had a future, the Georgetown School of Foreign Service also had a future and a foreign service fraternity, designed to promote the social and professional interests of foreign service men, likewise had a future. In October and November of 1919 they talked over among themselves this idea many times and became increasingly impressed with its possibilities. About the same time, another student at the School, T.J. Patrick O'Connell, approached Fred Arseneau with the same idea, which he had developed independently. This gave strength to the planning for a foreign service fraternity and soon a number of other students were also approached. In the latter part of November 1919, the original four men and a few other interested students met to discuss the founding at Georgetown University of a "foreign service fraternity". After their Christmas vacation they met again on Sunday, January 4, 1920, and decided that during the next week each man of the group should approach one other student whom he believed to be a desirable addition. Thus, on the following Sunday, January 11, 1920, eleven men (namely, future Brothers Bartlett, Sandager, Butts, Arseneau, Ash, O'Connell, MacKenzie, Brooks, Sullivan Scott and Bates) gathered together to sign a one-page Articles of Agreement to "form a Professional Fraternity of men entering or preparing to enter Foreign Service." At that same meeting, committees were appointed to select a name for the organization and to nominate officers. 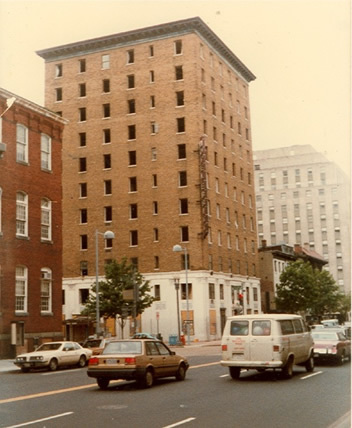 Two weeks later, on Sunday, January 25, 1920, the group, which by then consisted of nineteen School of Foreign Service students, formally founded Delta Phi Epsilon Foreign Service Fraternity in the basement of the Catholic Community House at 601 E Street, NW. They immediately appointed a committee on ritual, composed of Bros. Jack Walsh, Hal Butts and Harry Sandager, to devise a pledging and initiation process for the new fraternity. 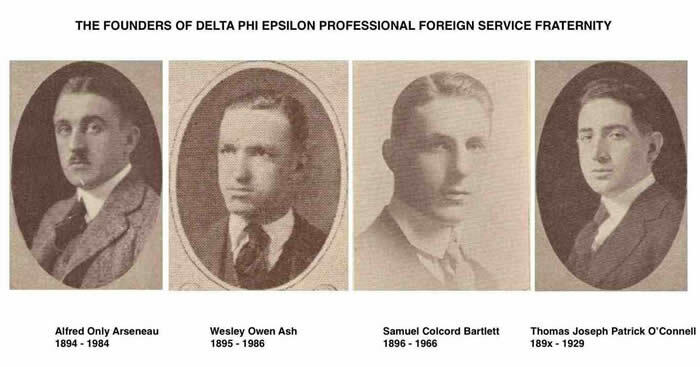 The first man to leave school and actually enter foreign service was Samuel Bartlett, one of the Fraternity's Four Founders, who departed for Japan in mid-January 1920 - a week before Delta Phi Epsilon's formal founding on January 25 - to work for the Fuller Construction Company. He was initiated into the Fraternity late the following summer, when new Bros. Halleck Butts and Martin Scott also left Washington for work in Japan, Butts having become the U.S. Trade Commissioner in Tokyo and Scott having become an assistant to the U.S. Commercial Attaché. The two met up with Bartlett and in September 1920, at Kamakura Beach, south of Tokyo, they formally inducted him into the Fraternity that he himself had helped found. At the speaker's table, from left, are: Bro. Perry Stevenson, Rev. Edmund A. Walsh, SJ, Bro. Halleck Butts, Bro. Wesley Frost, Congressman Clay S. Briggs (Dem., Tex. ), & SFS Dean Roy MacElwee. In the foreground are: Bros, Vinskey, Ash, Bates, O'Connor, Arseneau, Manning, O'Connell, Cain, Sullivan, Dotterer, Reilly, MacKenzie, Gruber, Moore, Sorenson, Breyere, Ulrich, Kane, Dolan, Ryan, Owen, Hickey, McCarthy, Sandager, Scott, O'Neil, Donnelly, Walsh, and Brown. Cropped out of this picture are Bros. Brooks, Shaw, Brown, Corcoran and Quinn. In late January and early February 1920 the new Fraternity conducted pledging for fifteen men, all of whom were inducted as brothers at the Fraternity's first initiatory banquet, held on Saturday, February 21, 1920, at the New Ebbitt Hotel, at 11th and H Streets, NW, in Washington, D.C. At this banquet, the Fraternity was formally presented to Georgetown University and, in turn, was accepted by the Reverend Edmund A. Walsh, S.J., the University's Vice-President and the Regent of its School of Foreign Service, who extended his personal good wishes and pledged himself to assist Delta Phi Epsilon in all its undertakings. Besides Fr. Walsh, there were present at the banquet all of the original brothers except but Sam Bartlett, as well as the fifteen new initiates and, as honored guests, the Honorable Clay Stone Briggs, a U.S. Congressman from Texas, Consul Wesley Frost, the Acting Foreign Trade Adviser for the U.S. State Department, Dr. Roy S. MacElwee, the Director of the Bureau of Foreign and Domestic Commerce of the U.S. Commerce Department and the newly appointed director of the School of Foreign Service, and Mr. Perry J. Stevenson, the Chief of the Commercial Attaché Division of the U.S. Commerce Department's Bureau of Foreign and Domestic Commerce. Just prior to the banquet, the Fraternity elected as its first officers: Bros. Halleck A. Butts, President; John J. Walsh, Vice President; Edwin A. J. Bates, Treasurer; and Wesley O. Ash, Secretary. In February 1920, the group was approached by representatives from the recently founded national commerce fraternity of Delta Sigma Pi with an invitation to become a chapter of that fraternity. The offer was declined because the members of Delta Phi Epsilon desired to restrict their group to foreign service. Moreover, even at that early date, the founders of Delta Phi Epsilon had the idea that their Fraternity might eventually itself become national. Click here to Continue to Part II of the History.